Let’s make one thing clear right at the start: if you’re looking for a thrilling crime novel that has you on the edge of your seat and makes you bite your nails in constant excitement then you can already stop reading right here because Richard King’s book „A Death at the University“ definitely won’t provide that. 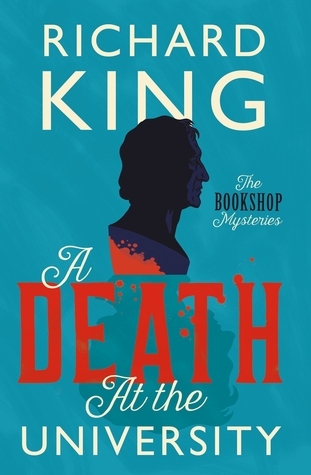 Instead this book comes with the teaser of being a „classic murder mystery“ and the first book in a new cosy crime series „for fans of Agatha Christie and Midsomer Murders“ and that’s exactly what you can expect from the book. What made the book so interesting to me is that the main character is not a police detective or a private investigator but a bookseller (!) that runs a little independent bookstore in the heart of Montreal and I just couldn’t resist the combination of murder and books. It all starts when protagonist Sam Wiseman wants to collect the money from one of his long-time clients for the latest book orders when he suddenly finds this professor Harold Hilliard dead in his office at the McGill University. In every other crime novel being the first one at the crime scene would probably make him suspect no. 1 especially since in the victim’s hands the police finds a special order form from Sam’s bookstore that the dying professor must have grabbed to give the detectives a hint at the identity of his killer but Sam can call himself lucky to know Detective Gaston Lemieux as a regular client from his bookstore. For some reasons Lemieux immediately trusts his bookseller and even allows him to be a part of the investigation and to help with with the questionings of witnesses and the like – that’s probably not the most believable setting to start a murder mystery with but since it was good for permanently linking the bookstore to the murder investigation I didn’t really mind inconsistencies like that. Having been given these privileges I have to admit that I was a bit jealous of Sam Wiseman. I mean, this bookseller guy can spend his whole life being surrounded by books and then even gets allowed to investigate a real murder – isn’t that every crime novel fan’s dream? So I could totally relate to Sam being overly excited about being a part of this investigation and therefore trying his best to make himself indispensable to Detective Lemieux so that he could stay involved until the conviction of the professor’s murderer. BUT I must say that I haven’t always been able to see Sam’s value for the investigation because for claiming to be a murder mystery fan I found him rather naive and sometimes thought that he was asking rather dumb questions, for example when he couldn’t imagine why someone would want to steal the laptop of a murder victim – seriously, Sam? Detective Lemieux had some kind of the same naivety because he is a rather old-schooled detective and sometimes seemed a bit unaware of modern aspects (like genuinely wondering why a renowned professor would password-protect his computer… *headdesk*) but on the other hand it was also nice to see that these two characters were rather normal people and not the super sharp investigators that other crime novels provide. I don’t want to give the impression that they were dumb but sometimes Sam and Gaston just seemed a bit unexperienced which is okay if you’re a bookseller but a bit weird if you’re a homicide detective in a city like Montreal. But to be honest I wasn’t really expecting a sophisticated murder case of this novel and even though Richard King didn’t present both his characters and his readers with a very intellectual challenge I have to say that I really did enjoy reading this novel and that’s probably because it never pretended to be more than it actually was. 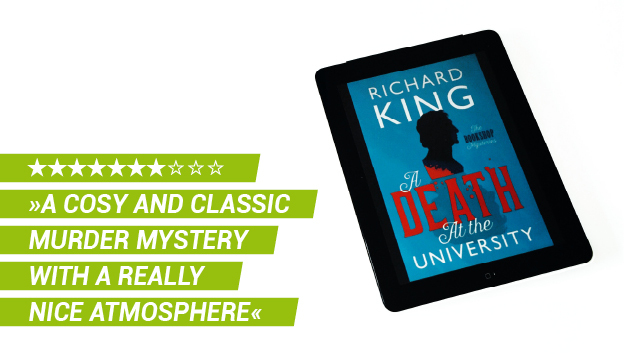 Like the description already indicated „A Death at the University“ is indeed a cosy and classic murder mystery and that’s nothing to be ashamed of. Richard King definitely did a good job in my opinion in creating a snug atmosphere and the city of Montreal made for a really nice setting as well. There was always enough time for Sam Wiseman and the other characters to hang out in cosy cafés or restaurants (seriously, his bookstore business must definitely be quite profitably if he can afford to dine out that often) or in his bookstore and overall there was very little violence so that the book is like the perfect read for a lazy Sunday afternoon on the couch with a blanket and a cup of tea/coffee/hot chocolate/whatever. It would have been nice if the bookstore would have been integrated even more into the story but eventually „A Death at the University“ lived up almost exactly to the expectations I had – which weren’t that high to be honest but this cosy crime novel definitely made me want to go back to Montreal one day and solve another „bookshop mystery“. Richard King’s novel „A Death at the University“ won’t have you on the edge of your seat due to nail-biting tension but if you’re looking for a cosy and classic crime novel with a really nice atmosphere then this rather old-school „bookshop mystery“ set in the charming city of Montreal might be the perfect book for you.